LOYALTY POINTS: We’ve launched ‘Fire Points’ – a new loyalty scheme for members – to encourage use of membership cards as often as possible. To celebrate, Season Member accounts will automatically be credited with 50 Fire Points. GUARANTEED WALES TICKET BALLOT: We want to help Season Members see some of the world’s best in action at the Principality Stadium. From the internationals this summer we will be extending our international ticket allocation to give more members a chance of accessing Wales tickets. REFER A FRIEND: Over the last two seasons the Bring a Friend offer has been very popular, so this year as well as retaining Bring a Friend for FREE vouchers amongst membership rewards, we’ve also introduced a Refer a Friend offer too. 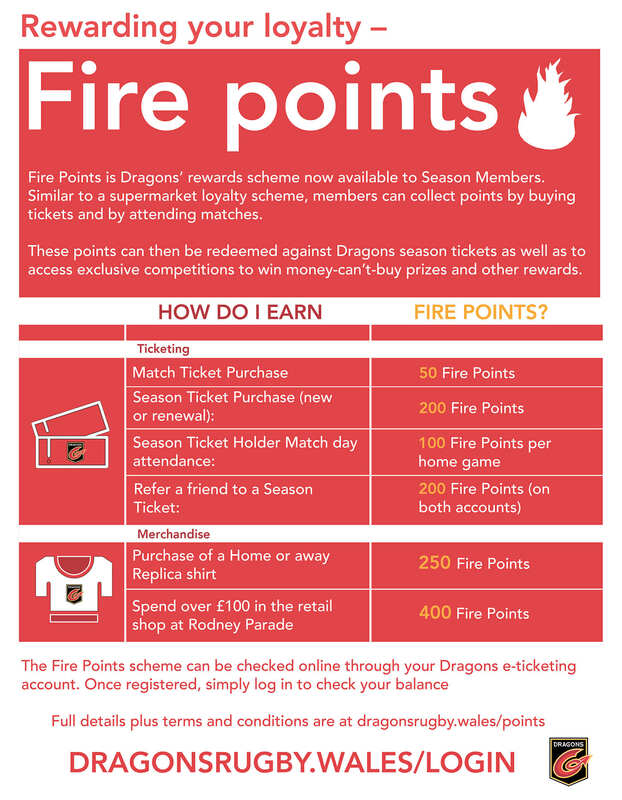 If a new member joins for the first time as a result of being referred by an existing member, we’ll give both of you £20 off in the Dragons shop at Rodney Parade and a loyalty point bonus. To Refer a Friend pick up a new Members Application Form from Rodney Parade or download it from dragonsrugby.wales – Forms available from Judgement Day.